The SQM-LU and SQM-LU-DL come with a standard 15ft (5m) cable which is the design limit for a standard USB connection. A USB cable extender may be used if you require a longer connection. * One customer reported problems with a different model (GUCE51), so we now recommend the above GUCE62 which comes with a power supply (not shown). Thanks for that tip. I am just doing a search for different brands of this type of adapters. 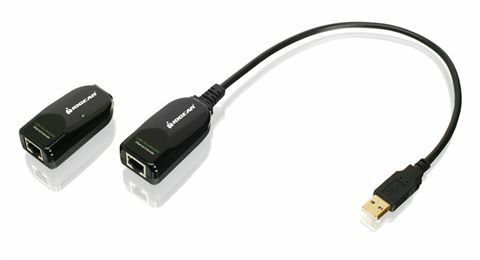 How reliable are they compared to USB extensions ? We have only tested that one (IOGEAR) brand. It has the advantage of you using your own cable at your desired length (up to 198164'). And, since it uses Ethernet cable, it can be terminated after the wire is strung through walls etc.. I think the USB extension cables should be just as reliable as the IOGEAR module. The extension cables I saw a while ago did not go up to 198164', that may be different now. Please let us know if you find one that works for you, or which one you are considering to try. Recently a customer had problems with the IOGEAR GUCE51 device, but the GUCE62 device worked properly. There could have been issues of USB level (2.0 vs 1.0) or FTDI driver issues. We are now recommending the GUCE62 device for extending the SQM-LU meters.